Anyone who has purchased or is thinking of purchasing a point and shoot camera would benefit from this book. The first and main section deals with tips about portrait photography using a compact or point and shoot camera. This is followed by a section that deals with getting the most out of a point and shoot camera when photographing various subjects. The final section deals with a very useful low light function that many compact cameras possess. The book contains a lot of information which is delivered in an informal, conversational style.It is fully illustrated using images shot with a hundred dollar point and shoot camera, by the author. 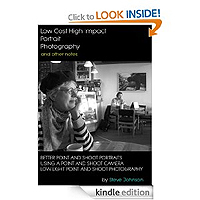 Anyone who has purchased or is thinking of purchasing a point and shoot camera would benefit from this book. Many of the tips and suggestions are also applicable to any type of camera including DSLRs. This book has three sections all geared to using 'point and shoot' cameras. The first is indeed about portrait photography per the title. The second covers other subjects and settings using such a camera and the third using its low light features. I was able to find my way around this book easily and I was overall impressed with the content. I believe that if I can learn just one thing from a book such as this then it is a worthwhile book. And I did and therefore for me it is. The most significant tip I learnt was "Don't cut people off at the joints" (from the 'Cropping' section). This may seem obvious to others but I had never given it a thought before and it was a revelation to me. There's no doubt that Steve Johnson is a good photographer, as the examples in this book bear witness. However, although I have become conditioned to expect typos and so on in Kindle books, this book does have rather a lot of errors which sometimes made the reading and understanding of the content a little difficult. There are also minor formatting problems. In my Kindle for PC I had to use a a very small font size in order to keep most photos on the page with the text describing them and most photo captions staying under their photos. Not to worry. It IS difficult to produce a Kindle book that looks perfect when there are so many variables to consider. AND, I love the photos. Steve Johnson didn't only capture some fine art here; he managed to bring us the warmth between himself and his wife, Meg Wolfe, in the photos of her. This was a free download for me but I think once the errors have been removed it deserves to have a decent price attached. In contrast to other reviewers I found the book very useful. It is true to the product description and does not purport to be a photography course. Most of all the author takes the mystique out of taking photographs and provides a common sense approach. I would recommend the book to anyone considering taking up photography as a hobby. You can always purchase additional books in the future to improve your technical knowledge.